Termination is the act of bringing something to an end¯a strong word that not many like. It pertains to a parting and closure. It is associated with a negative vibe, but not all termination is a bad thing. There are times that they could lead to a positive outcome and greater good. In businesses, especially companies, there are a lot of terminations that may happen like the termination of an employee or a contract. It is not always easy to deliver the termination process toward the recipient so that is why terminations usually are conveyed through formal letters. Perhaps you are in search for termination samples so you could compose your own. 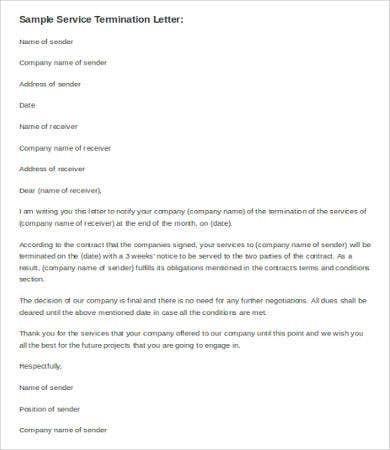 Here we provide you with some Termination Letter Template to start you off. whether or not the addressed can appeal for termination. Appeal letter. Termination from workplace and job position is never good news to hear. Appeal letters could be given to the company to ask for reconsideration and request a review for all the hard work you’ve given for the company. 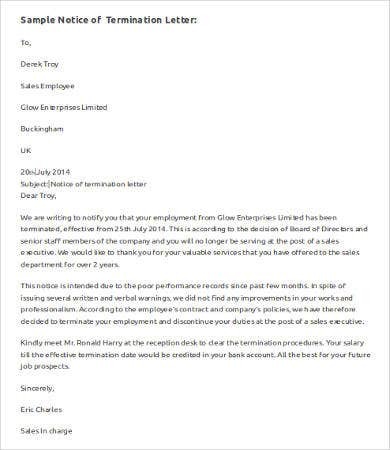 Employee termination. 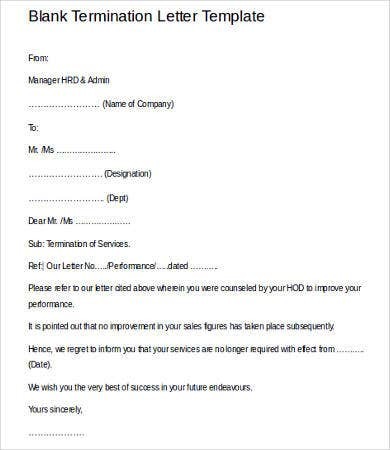 This is also known as the Job Termination Letter. This is where the management explains whether the employee had been lacking in skills to continue working for the company or the company is downsizing. This sample letter can simply help you with delivering the news to them. Business Letter. 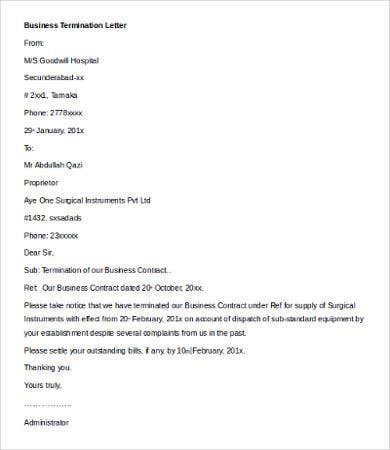 This could also be considered as a Partnership Termination Letter. 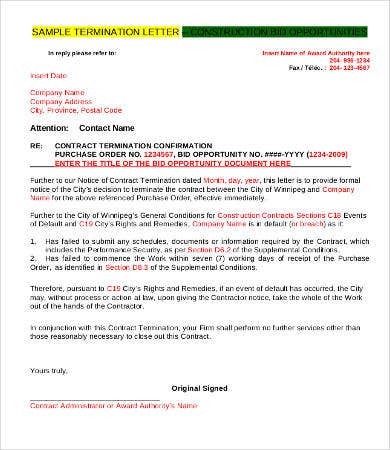 This termination letter pertains to the closure or ending of a business contract with another company or business partner. Notice of termination. 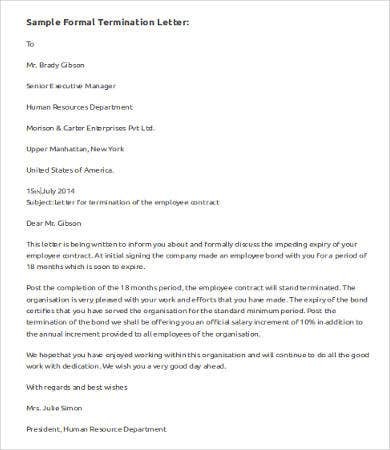 This type of letter is the head start of a certain company to let the another business partner know that they are planning on cancelling a contract. 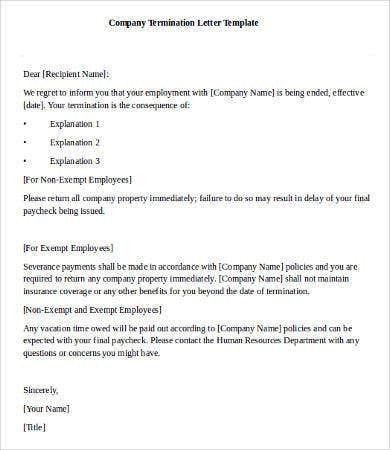 Aside from the examples given, don’t forget we also offer some blank letter templates that you can use for your own purposes and you can add your personal touch to it. 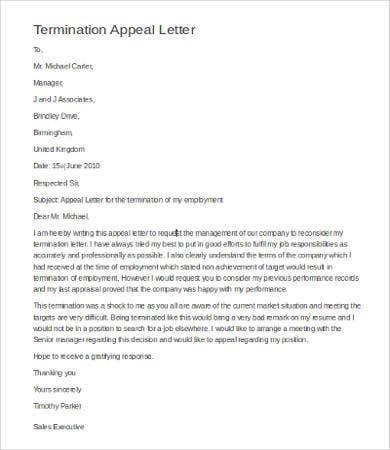 Why Deliver a Termination Letter? 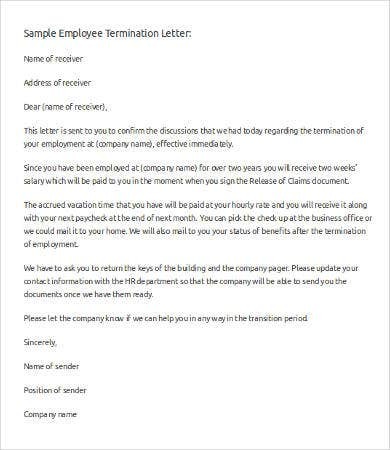 Making a termination letter with complete information gives the recipient answers on some questions that may surface on to why the termination happened. It is not abrupt. Putting it into letter form presents formality, especially for notices. This sometimes gives the recipient a chance to try to redeem himself or to prepare for the cutting of connection. It serves as a written document to prove that termination has indeed taken place between the two parties. 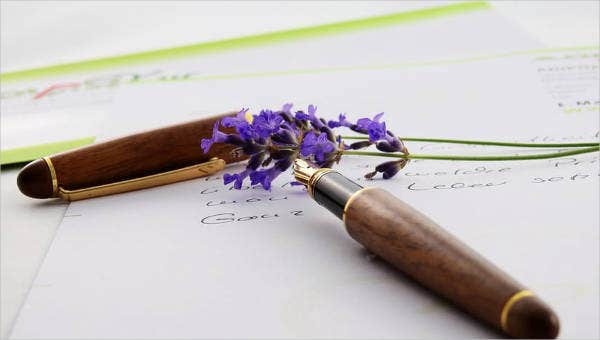 Writing it in letter form gives the provider of the letter a chance to explain in details on why the termination has to take place. 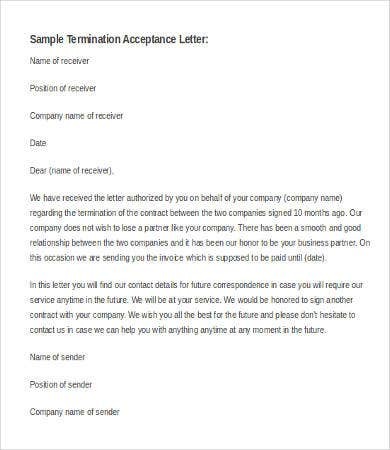 On our website, we provide free, accurate, and helpful Sample Letter of Termination that you can use or aid you in your plan of termination of a contract or an employee. Download the templates which suit your situation best.